Church of St. Cuthbert, on west wall of nave, upper of two. Roll of Honour, 11 inches high x 13 inches wide in a wood frame 2 inches wide. Handwritten on parchment and behind glass. 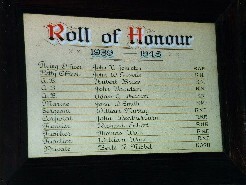 The words "Roll of Honour" are in illuminated Gothic script. The names are handwritten in a single column in copperplate. 12 names with rank and regiment. Flying Officer      John D. Johnston     R.A.F. Petty Officer       John W. Guthrie      R.N. A.B. Adam A. Wharton      R.N. Marine              John W. Smith        R.M. Private             Berte R. Nisbet      K.O.S.B.